Yesterday, I visited my rehab client. It was the first time I went there as a patient, not a writer. I always told my family, “If anything happens to me, send me here.” They have a free sports medicine clinic on Sunday mornings. (I know because I wrote their 16-page brochure, flyer and web site.) So I took advantage of it. I wanted to see an orthopedist who understood athletes. I didn’t want a lecture about how bad running is for the knees. I saw what osteoporosis did to my mother’s back. Three bone breaks in her later years. So for me, it’s more than just I want to run. I need to run. I have to run. My first bone scan a few years ago proved it. 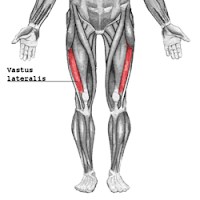 Turns out, its two very pissed off tendons from my ITB and quad (vastus lateralis) that connect to the top of my outside part of my knee. I told the doc I’ve got a marathon in three weeks. He said, “Okay, let’s see if we can get you running next week. In the meantime, swim to keep your cardio up. You can do as much as you want in the pool.” Then he handed me a prescription for three treatments a week, consisting of cortisone shots and ultrasound to bring down the inflammation. Of course, he didn’t make any promises. He didn’t tell me to take two months off. He didn’t take the marathon off the table. If I’m in a lot of pain in three weeks, I won’t run it. I’ll be grateful for what I was able to do this year. For now, there’s still hope. The train hasn’t left the station.